If there was one thing that drove my mother completely over the edge, it was food waste. We were a timer family, for sure. And there were many nights where we children would sit at the table, faced with the impossible choice between consuming whatever was set before us or suffering the punishment for committing the unforgivable sin. Since we had cats and no dog, there was no pet under the table to help, either. My mother didn’t just have starving children in Africa stories. She had depression-era horror stories and Germany post-WWII famine stories to add variety to the starving children in Africa. They all seemed to be on rotation. In what can only be described as a deadly combination, she had no regard for expiration dates. Which is how I found myself in this particular predicament. One fall morning, around 1983 I would guess, I sat at the breakfast table where I had been served a bowl of Rice Krispies cereal with sliced bananas floating atop. Pretty typical breakfast, definitely one I enjoyed. Beat the hell out of reheated oatmeal, but I digress. As is typical of most 7 year-olds, I was particular about the details of my food. I complained to my mother about the unusually high number of burnt rice bits. While normally you could find the errant brown bit, this bowl was pushing a 50/50 ratio, and I did not appreciate it. Now timers for dinnertime were a possibility, but in the middle of the morning rush, you just ate your breakfast and moved on with life. This was unchartered territory, and so my exasperated mother suggested I just pick out the burnt krispies. A magnanimous gesture on her part, since that meant a half of a cereal bowl-worth would be wasted. I’ve never been a patient person, but at that moment I knew I had best take out the burnt ones so I could handle eating whatever was left. Using my spoon, I isolated each brown krispy and transferred it carefully to the folded napkin next to my bowl. When I had done at least enough work to navigate a few bites of brown bit-free cereal, I went back to eating my breakfast. My plan was to go layer by layer, stopping in between to eat what was salvageable and then returning to brown krispy extraction detail. I wish I could tell you that I removed every single brown rice krispy. I wish I could tell you that thanks to my diligence, not a single burnt rice kernel passed through my lips. 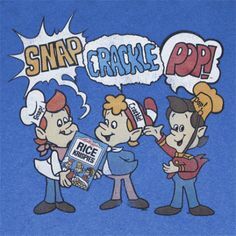 Oh, how I really wish I could tell you this, because after a few rounds I got sloppy and gave up on the sorting, and around that time I glanced down at the napkin full of brown Rice Krispies and saw them wiggling about in their little dance. Oh yes, I had consumed a solid number of banana slice topped weevils. Look at those smug jerks mocking me. I’d also like to tell you that my mom felt horrible about this fact, but that wouldn’t be true. She was upset, however, that the cereal had to be discarded. At least she didn’t take the opportunity to let me know that the starving children in Africa would have happily chewed up the weevils as part of their complete breakfast.